Shopify Google Analytics is an extremely powerful tool for visualizing how visitors interact with your ecommerce store. And with this data, you can make actionable changes to improve your sales and traffic. But the main problem with Google Analytics is that it’s way too complicated for the average user. The sheer number of options, switches etc… make it hard to figure out where to find your data. In addition, many of the options are not well explained. Now as an engineer, I can appreciate having all of the extra control and the expanded feature set. 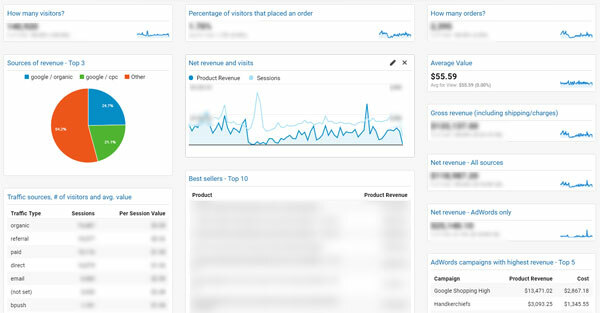 But after teaching my ecommerce course for over 7 years, I’ve found that the average ecommerce store owner rarely looks at their Analytics (outside of traffic reports) because the tool is too intimidating. As a result, I’m going to show you how to extract out the useful information from Analytics that should be good enough for most of you. In reality, you don’t need to understand every bell and whistle to run a successful ecommerce store. First off, this post will not address how to setup your Google Analytics. If you are on a good fully hosted shopping cart like Shopify or Big Commerce, they should provide you with detailed tutorials on how to get Google Analytics setup for your site. After all there’s no point in regurgitating shopping cart specific information that is readily available online. Instead, I’m going to focus on how to use Google Analytics data to drive your actions. That being said, you should make sure the following is setup correctly. Once again, if you do not know how to setup up anything above, contact your shopping cart provider and they should help you get going. 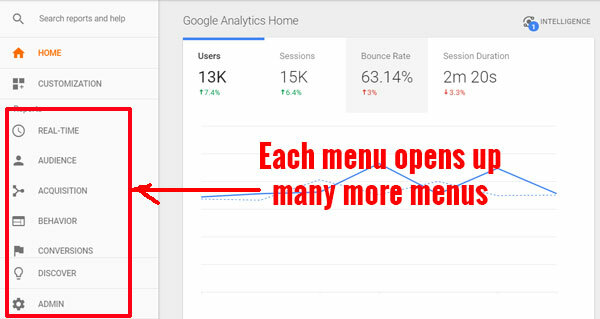 Most of the heartache in using Google Analytics lies in navigating an impossibly large set of options in the left hand side menu. For example, here’s what it looks like when you login. To find what you need, you often have to click on a series of menus until you find the right category. Then you need to set up filters to extract what you need. But given my personality, if a piece of data takes too long to find, I will be too lazy to check it regularly. As a result, I rely on several ecommerce dashboards to tell me the overall health of my shop. A dashboard is a way to organize your Google Analytics data so that you can easily extract out the good stuff without having to navigate an infinite array of menu options. All of your key performance indicators should be on the dashboard so you only have to dig deeper if you discover an anomaly with your data. The dashboards that I’m about to show you are free and can be obtained at a site called Dashboard Junkie. These dashboards are easy to install and should satisfy at least 80% of your analytics needs. This first dashboard gives me an overall view of how my online store is performing from a 50,000 ft level. Specifically, I look for anomalies in site traffic, overall sales, traffic referrals and top products. For example, there was one month a few years ago where my credit card expired for my Bing ad campaigns. As a result, those ads stopped running and I probably wouldn’t have noticed if it were not for the fact that Bing stopped showing up as a referrer in this report. Once I dug a little deeper, I noticed that Bing revenue went to zero and that’s when I realized my mistake. I also make sure that my store is tracking to grow from year to year. Sometimes if it’s a slow month, I’ll send out additional emails or more promotional campaigns to up our revenues. 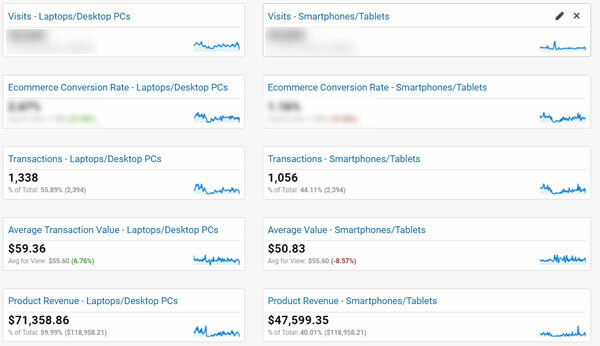 This dashboard gives me an overall view of how my store is performing on desktop vs mobile. We all know that mobile is taking over the world and this report helps me keep tabs on my mobile performance. The image above is actually a real snapshot of my shop and right now mobile traffic is nearly double that of desktop traffic. However, my desktop/laptop earnings significantly exceed that of mobile. While it’s hard to draw any conclusions from this one data point, it does indicate to me that my customers are much more comfortable completing transactions on a real computer as opposed to a smart phone. In any case, I use this report mainly to monitor my conversion rates on mobile vs desktop. If there are any significant fluctuations, then I’ll usually dig deeper to find out why. I generate a lot of revenue from running Google Adwords but in general I hate logging into the Adwords manager. Instead, I access this quick and dirty Google Analytics dashboard to get a high level overview of how my campaigns are performing. The number one thing that I look at is how my campaigns are converting. I expect to make at least a 3X ROAS for my campaigns. If anything drops below that amount, then I take a closer look why. Right now, it looks like my main “handkerchief” campaign is not performing as well as I would like. As a result, I’m going to take a look at the keywords to see if further optimization is required. In addition, this dashboard allows me to quickly spot which products and keywords are performing the best which may affect my bidding strategy. There are 3 types of customers who shop in your online store. The Browsers – These customers use the navigation menus on your shop and browse your products until they find something they like. The Searchers – These customers gravitate immediately to the search bar on your site and type in what they are looking for. While all 3 customer types are important, I’ve found that most online shop owners neglect the “searchers” on their site. For example with my ecommerce store, a significant number of visitors use our search engine and it’s important to analyze their behavior. In fact, 95% of my customers leave my site if their search yields zero results! By going to Google Analytics and clicking on Behavior->Site Search->Search Terms, you can get a full report on what customers are searching for on your shop. This data can be used in the following ways. Improving Your Search – By looking for misspellings and synonyms for your products, you can add these keywords to your on site search engine to yield better results. Discovering New Products – By analyzing the customer searches that return zero results, you can find hidden products that you should be carrying in your shop. For example several years ago, we noticed that many customers were searching for “vintage hankies”. As a result, we decided to sell them. Over the years, the Google search report has allowed me to fix my on site search engine problems and improve the conversion rate of my online store. In addition, several of our product decisions have been influenced by our customer’s search intent. The problem that most brick and mortar stores face when launching an advertising campaign is that they can’t easily track how much money and foot traffic resulted from the ad. With an online store however, you can easily measure the effectiveness of your online marketing campaigns via click tracking in Google Analytics. For example, whenever I send out a broadcast email to my store email list, I insert a link to my online store within the email that is specifically tagged with our promotion. As a result, whenever someone clicks on that link, I know exactly which marketing campaign caused the sale. In addition, Analytics tells you exactly how much money you made from your promotion. In order to extract this information from Analytics, you must make sure that your links are properly tagged. 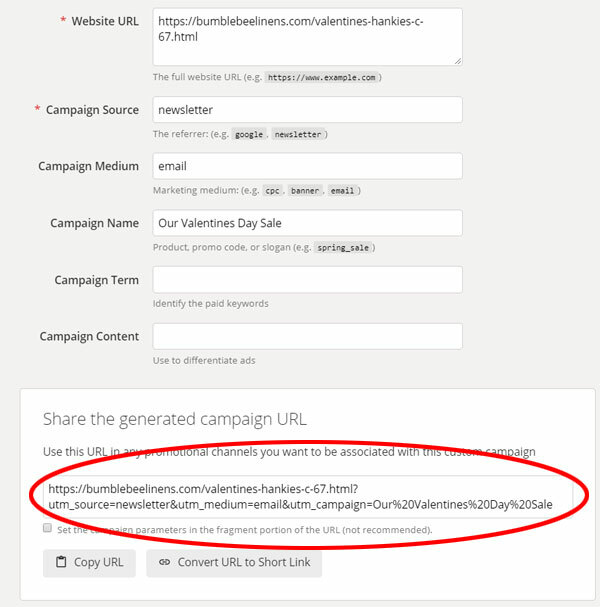 Here’s an example of how I used the URL builder to run my Valentines Day email campaign. By sending out the circled link above in my emails, I’m giving Google Analytics the information it needs to track the performance of my campaign. Then in my Analytics console, I can navigate to Acquisition->All Campaigns to view the data. In this case, my Valentines Day email campaign made me $1458. I routinely monitor my sales channels to see how they are performing with Google’s acquisition reports. Acquisition reports give you information about how your visitors found you and how they arrived at your site. Specifically, I focus on which channels are driving the most visitors and which visitors result in the most sales. Here’s my general philosophy when building traffic. Instead of spreading myself thin and trying to implement as many acquisition channels as possible, I look for my best performing channels and double down on them. For example, if Facebook ads are performing extremely well for me from a conversion standpoint, I’ll double or triple the ad spend. If influencer marketing is driving the needle for sales, I’ll focus more effort on influencer marketing. Google analytics allows you to easily filter out which channels are driving your best traffic so you can focus your efforts. The behavior reports allow you to nail down which pages on your site are yielding the most sales or leads on your website. In addition, Google provides you with other metrics like bounce rate, load time etc… so you can improve your content. If you have ecommerce tracking setup, you can easily figure out which landing pages are the most effective at generating sales or converting email subscribers so you can focus your efforts on optimization. Simple navigate to Behavior->Site Content->Landing Pages to see your top performing content. According to the report above, people landing on my ladies handkerchief page are converting at almost 3% and generating a decent number of sales. Overall, behavior reports help you focus your efforts on pages that need improvement which will ultimately lead to more sales. If you set up your goals and funnels properly, you can track how your customers navigate through your site step by step. One funnel that is particularly useful to monitor is your checkout funnel. Once a customer begins checkout on your site, you need to make sure that they complete the sale. To view your funnel reports, navigate to Conversions->Goals->Funnel Visualization. Then, look through each step to see where customers are leaving your site. Once someone starts the checkout process, they should have a high probability of finishing the transaction. But if there’s a particular step in your funnel where customers are abandoning their cart, then you need to take a closer look. For example, if a high percentage of customers are leaving your site on the “shipping” page, then your shipping costs might be too high. If they are leaving on the payment page, then perhaps they are leaving your site to look for coupon codes. 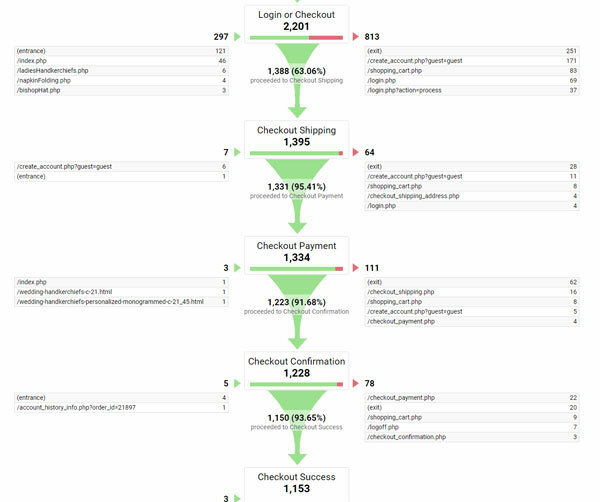 Overall, I like to use the checkout funnel report along with a visitor tracking tool like HotJar to diagnose my checkout problems. Monitor And Improve Your Landing Pages – Check to see which pages are generating the most money on your site and optimize the heck out of them. Make Sure Your Checkout Process Is Solid – Take a close look at your checkout funnel to see if people are abandoning their carts during a certain step. 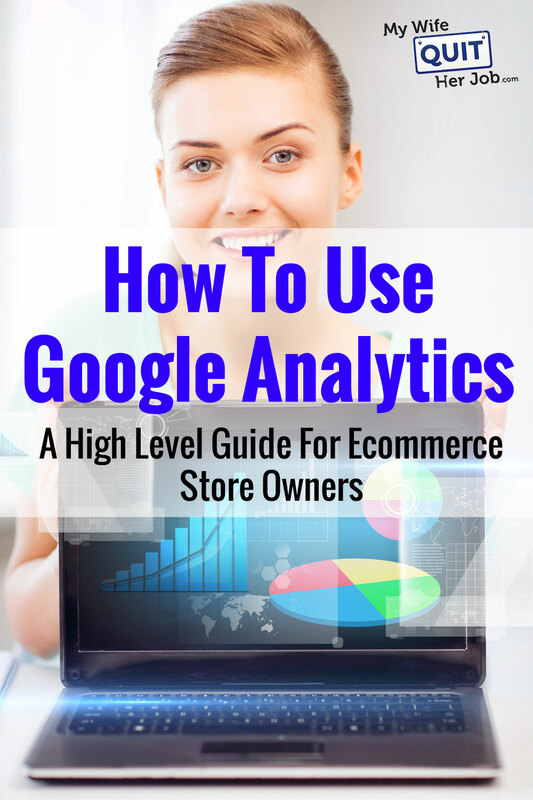 Even though Google Analytics can be confusing, if you can master everything that I mentioned in this post, you will be better than 90% of the other ecommerce store owners out there who never even check their stats! The key is to leverage Google Analytics to focus your actions that have the greatest impact on your bottom line. I’m curious as to how you integrated the ecommerce analytics with OSC. I can’t figure out how to do that. Is there a tutorial that you used? I actually did all of the Google Analytics integration with OSC myself. If you need help in this regard, I can show you my source code. However, I believe that there are several OSC GA plugins that are available as well on the OSC website. Thanks for responding! I have a stand alone OSC site right now. I’m working on using WordPress as a front landing for the site and then using the WordPress OSC plugin in the back end and just switching everything over from the old database. If that doesn’t work I have to do it manually. It would help to see which products are worth moving over first. If I don’t find a plugin that works I might stalk you for the source code. If you wouldn’t mind, I’d love to see your online store. I am a blogger who has been fortunate to go into partnership with an internet techie geek. His my mate so i can get away with that. He loves google analtics, where i used to love another similiar product. But he has certainly proved time and again its value for both our blogs and our ecommerce shop. We are about to set up our first wp shop and combined blog so i assume it will show its value even more. Great post! I actually do some of the same types of analysis with the keywords that come in to my blog. I want to know what keywords bring the visitors that spend the most time, click around etc. Sometimes I even write posts directly from a long tail keyword like my post on ‘Would QE3 Cause Stock Prices to Go Up?’ This was an incoming keyword with a visitor that spent some time on the site so I know they would come back for that post or some one similar to them would. It takes ‘writing for search engines’ to a whole new level when I can use search engines to ‘write for the reader’. Nice! It’s always good to have a tech geek around when you need them. Good luck with your shop and send me the URL when it’s up! Come to think of it, I do the same thing with my blog and Adsense. Whenever I find a topic that has a high PPC payout, I tend to write more about that topic to maximize earnings. Thanks for bringing this up. Most of the Points are very-well highlighted. Pretty insightful. I would like to that the Google analytics through its GOAL features also tell you from what Page or the product did User convert or which particular page is not performing well. The new feature of Multi-channel has taken analytics of E-commerce websites to the new Level of perfection which could give out information upto City level.Further,Could also throw similar insights on Recently launched Twitter Analytics. These are good points on how and what’s of Google analytics. The Google analytics certainly plays an important role in determining the site’s performance. Thanks for sharing your experiences. I really do agree that any business should use Google Analytics, especially because it’s free! I’m fairly new to it – I started working for a small IT support company about a month ago so am still working on Google Analytics and getting used to how it works – but it is so handy in seeing how many pages ofyour site are viewed and how long for. I’m working on SEO and improving the website, so this is so useful for me! I have personally found that whenever we send our monthly newsletter, we get more views than the rest of the month. Thanks for your informative article Steve – it was very interesting to see how you used your results to improve the business, such as including European Handkerchiefs as a product on your online store as a result of many searches. I think that it’s all well and good having the tools to measure analytics (and google analytics is great for that as well as being free! ), but a lot of people struggle with using this information in order to address problems within their business. Similarly to you, we discuss how important this is, and ways people can for clear goals and a defined strategy http://ow.ly/7Zd95. Giant Google has made a unique platform from where we can easily get our resources. I think there is no alternative way today without Google Analysis for business. This article was highlighted in a most recent email from analytics and drew me toward it. Have to agree with the points, albeit point One, is far less effective today than it was 9-10 months ago when google started masking keywords for people who have signed into google. In fact that seriously hampers point One, and requires a lot of sophisticated work arounds to grasp this critical point. Unfortunately it will continue to get worse over time. We definitely focus on point 5 for a critical point. The above referenced business and some of our others are very attached to search and because of that naturally google. We work all the time to review how our off line efforts reflect bottom line results. Just reviewed a business re: August results this year and last. Noticed a marked difference and one reflection had to do with some offline advertising which may or may not have contributed to a significant change in revenues. Now here is a different perspective that we had using–not only analytics, but our in house analysis of results and adwords along with analytics. The business is local and regional. We noticed “impressions” was way down for a critical geo portion of the market in adwords. Other locations were consistent. We checked analytics for the two comparative time periods …and yep not only less people thinking about the topic via adwords…but the geo portion of analytics told us less visits to the site. We had less sales that corresponding month from that target geo region. Meanwhile in the comparative month…we had run a newspaper campaign. Definitely insights that helped us with regard to understanding off line results. That was a great read, Steve. I do recognize that any company needs to utilize Google Analytics. I’m reasonably new to all of these concepts and this article definitely helped me grasp the idea better. Google definitely produced a unique system in which we are able to very easily gauge how our businesses’ websites are doing. I do believe there is no other viable option that can offer this kind of good quality service, particularly since it’s free of charge! Great post on GA – Google Analytics is a powerful beast and hence one needs to learn how to get the best out of it. Can you recommend any decent beginner-level courses on GA? 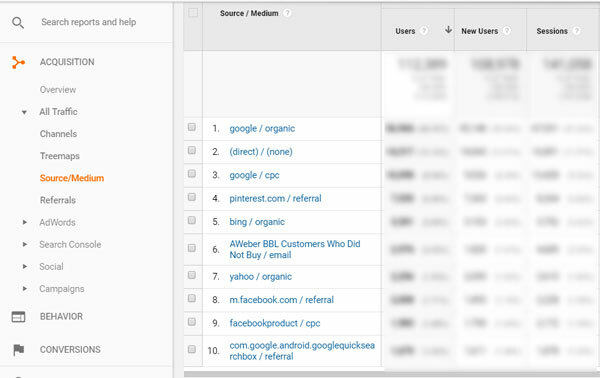 Great article, we use Google Analytics to analysis the keywords potential customers use to reach our client websites. This is a great way to learn if your choice of keywords is targeting the right audience. Great Article–We have tried a few analytical programs but believe Google’s Analytics is by far the best. Great article Steve. Companies should utilise Google analytics to help grow their web presence or at least get an ideal of where they are receiving traffic from and how much. Unfortunately most of the other tools on the market came at a cost but as a free tool you can’t really go wrong. I have an affiliate site store, where I can sell more products from here and develop my site can you tell me?